I really miss those days when the guilty pleasure of snooping social events only happened once a week during breakfast, while reading the society page of the Sunday newspaper. Now, thanks to the invention of social media (although I have to admit that it’s very useful for many things) that snooping has become a daily, addictive and constant activity in our lives. Events, celebrations, promotions, first days of school, trips, news, and a good article here and there, swarm in my cell phone practically all day. I also miss those days when if for some reason I missed a party, the only reliable source of information I had was from a friend who had attended the event, and I had to blindly trust her descriptive ability. Her judgment and narrative capacity confirmed or denied all the rumors that had been unleashed after the event. Now, when I miss a party, my iPhone becomes that best friend that gives me a mostly complete story of what happened through photos, videos, and comments. Sometimes even with so much detail, that I can see unwanted photos that accidentally got posted and that will remain in cyberspace forever. I have to admit that sometimes while scrolling through Facebook or Instagram, a weird internal discomfort arises when questions like - Why did I not hear about that event? Was that concert good? Did they have lunch together? I wonder why they didn’t invite me? Are those pants trendy right now? Where can I get them? - invade my head. A whirlpool of toxic thoughts that someone in the digital world defined as FOMO, or Fear of Missing Out. FOMO is that fear or anguish that we feel when we think we are missing something that’s being posted on the Internet. FOMO is real and it attacks us all, but one of the advantages of my 43 years is that I'm mature enough or at least I think I am, to shake all those thoughts out of my head, put the phone down for a while, breathe deeply and just think: I'm where I have to be, I'm not "missing out" on anything, I'm going to live and enjoy this present moment. My personal formula is to transform the FOMO into JOMO, or the "Joy of Missing Out." So, I can’t help but wonder, as Carrie Bradshaw would say, are our kids ready to handle this FOMO? How can we help them? 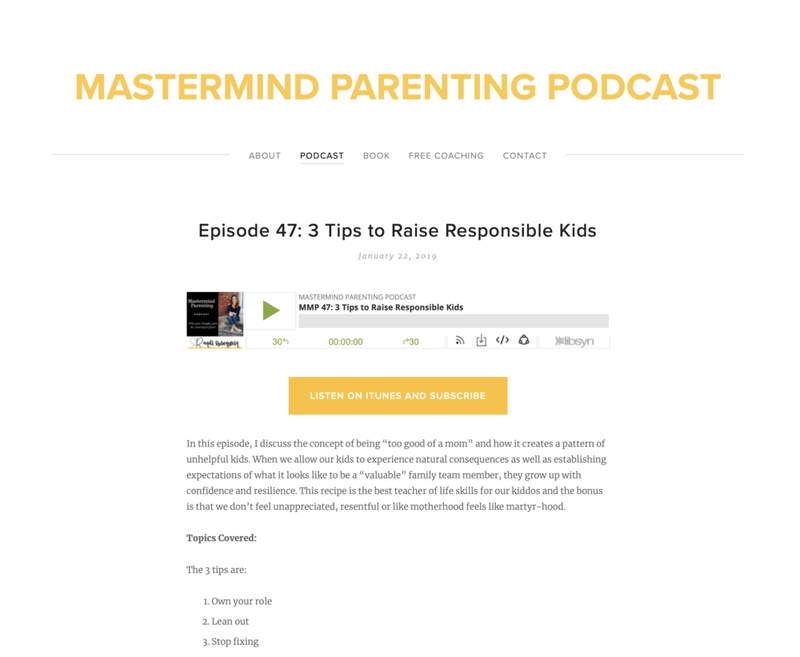 Last year I had the opportunity to meet Randi Rubenstein, a fellow mom, parenting coach, author of the famous book “The Parent Gap” and host of the very popular podcast “Mastermind Parenting”. After listening to her talk about her parenting experiences, I was instantly hooked to her caring, loving and super empathic way of parenting. I immediately knew she would be perfect to help me with this very important matter. 1.Until what age would you say it’s best to wait for our kids to have social media? Should we start with just one platform? Which one would you recommend? In my family, our rule is Instagram in 8th grade and FB and Snapchat in high school. I think it’s helpful to have a clear plan and your reasons why. Kids want to know why. The old “Because I said so” mom answer from yesteryear, doesn’t fly in this day and age. Our kids have way more of a voice than we did and that’s a good thing! I tell my kids from a very young age that my job is to love them and to do everything in my power to keep them safe and healthy. Social media before a certain age is not healthy for their brain in my opinion. By 8th grade, I trust that they have the tools to begin navigating the digital world socially. I don’t feel comfortable with Snapchat or FB until high school when their brain is a little older and able to detect scary or risky situations more clearly. I love the “Wait Until 8th” movement. Another of my favorite resources is the website for the documentary, Screenagers. 2. What is FOMO, and how would you say our kids experience FOMO in this Social Media Era? FOMO or Fear Of Missing Out is very real at every age. It can be especially painful for our kids growing up during our current “digital age.” As adults, I think many of us can relate to that yucky feeling that bubbles up when we feel left out of that party or gathering…not that anyone wants to admit it! Our primal need to belong and to be part of the community becomes triggered when we witness our kids experience FOMO. It reminds us of all the times we experienced that same crappy feeling. It’s important to be onto yourself and not to accidentally exacerbate the problem by jumping into helicopter-mom-fix-it mode by attempting to get your child included. Instead, begin an ongoing conversation with your kids about FOMO sensitivity and why as a family, you choose kind inclusive behavior. FOMO never feels good whether you’re 13 or 37. Focus on enjoying the moment in real time rather than constantly needing to take pics and post. And when your kids experience FOMO as they scroll on Instagram or Snapchat and see all their friends at the party where they weren’t included, empathize and display that, “you get it.” Let your child know, you’ve felt the exact same way as well. Quickly get back to focusing on your family values around inclusivity and kindness and remember, “What you focus on…GROWS”. Focus on being people that are part of the solution rather than taking part in exclusive behavior. 3. How do we help them cope with feeling left out and then going home and being exposed to everything they “missed” on social media? Again, you want to focus on your family values and being part of the solution. Most people, especially teenage people are really just trying to survive - to feel seen and worthy. It feels terrible to feel left out AND it’s gonna happen, unfortunately. You can discuss with your kids that most families are simply not talking about what kindness and inclusivity look like in real life. I don’t think folks are posting pics to be malicious and mean spirited. I think it’s more of simply going through the motions of the current social norms without really thinking about the ramifications. I always go back to focusing on what we stand for as a family on a deeper level. I think it’s important to talk about your values. Personally, I teach my own kids that It’s not sensitive to post pictures from a party on social media. When others do, and my kids experience FOMO, we end up having rich conversations about the fact that most people are simply not thinking about it and we choose to be different. 4. How should we talk to our kids about this matter so that they actually listen to our feedback or recommendations? What should we tell them that really resonates with their reality? Empathy. Empathy. Empathy. See the situation from their perspective. Hold space and listen without giving guidance. Share stories of when you’ve felt similarly and send your kids the message that they’re not alone. This is the real antidote to FOMO, building resiliency and becoming part of the solution. Super empowering! 5. How can we identify if our kids are presenting anxiety or stress disorder because of this? The anxiety and stress will be greatly relieved when you EFFECTIVELY empathize and use empowered rather than victimhood language. I know it’s hard when you find yourself triggered as a mom…AND it’s important to work through your old wounds on this topic rather than accidentally adding to your child’s anxiety. Trust me, I speak from experience on this. 6. Can FOMO affect their Self-Esteem or their sense of not feeling “good enough”? How do we minimize the impact? First of all, no one has the power to make you feel any particular way. It’s how you’re interpreting their behavior and what you’re making it mean about you. There is a new conversation between parents and kids that involves empathy, focusing on strong leadership energy and being part of the solution. When you learn to have empowering productive conversations with your kids, it’s a confidence-building game changer. 7. With our kids being bombarded with news and information on Social Media, how do we teach them to discern what’s real and what’s not? I think an ongoing open dialogue is so important. Explain the need for time parameters around social media scrolling and usage. Most of us know that the minutes quickly become hours and even days on social media. That time spent almost always leaves us feeling not great. Fake news is unproductive and serves no one. It’s usually high-level manipulation with a sinister underlying purpose. Let your kids know about that. This conversation is so important, and you can even game-i-fy it by inviting your kids to be smarter than the marketers by sniffing out the photoshopped bodies and fake news. In short, this post comes down to three words: empathy, empathy, empathy. I think that to let our children know they are being heard and understood without jumping into solutions right away, can really be helpful not only for this specific subject but for many more. Thanks so much, Randi for sharing your expertise with us! Hope to team up with you again in the near future.